The 2nd edition of the Handbook of Technological Pedagogical Content Knowledge (TPACK) for Educators addresses the concept and implementation of technological pedagogical content knowledge—the knowledge and skills that teachers need in order to integrate technology meaningfully into instruction in specific content areas. Driven by the growing influence of TPACK on research and practice in both K-12 and higher education, the 2nd edition updates current thinking about theory, research, and practice. The Handbook of Technological Pedagogical Content Knowledge (TPACK) for Educators is simultaneously a mandate and a manifesto on the engagement of technology in classrooms. "In 2008, the AACTE Handbook of Technological Pedagogical Content Knowledge established a new context for thinking about infusion of technology in teaching. The influence of this book has been reflected in the hundreds of articles, books, dissertations, conference presentations, and symposia stimulated by its publication. The second edition of the Handbook of Technological Pedagogical Content Knowledge (TPACK) for Educators is a worthy successor to the first. Updated to reflect current research and understanding of best practices in this area, it is destined to become a key reference for anyone who is interested in technology in teaching and learning." 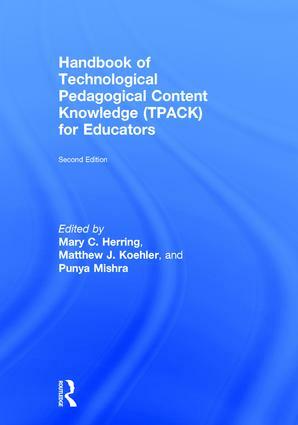 "A must read for TPACK researchers and practitioners, the second edition of the Handbook of Technological Pedagogical Content Knowledge (TPACK) for Educators provides a valuable and useable update on developments in the very active TPACK community in the 8 years since the first edition. From new methods and instruments designed to study TPACK to specific descriptions of successful approaches to developing and using TPACK in different subject areas, this second edition connects readers to the latest developments in this very important area." "Having designed pre-service and graduate courses using the TPACK model and applied the model in our scholarship, we found the book provided us with insight, clarity, and inspiration for future use… Anyone with an advanced academic interest in TPACK should find something in the handbook that will enhance understanding of the model." Mary C. Herring is Professor of Instructional Technology at the University of Northern Iowa and former Chair of AACTE's Committee on Innovation and Technology. Matthew J. Koehler is Professor of Educational Psychology and Educational Technology at Michigan State University. Punya Mishra is Professor of Educational Psychology and Technology and Director of the M.A. in Educational Technology program at Michigan State University.